Dubbed the Matterhorn of Kerry by Richard Mersey, Mullaghanattin stands proud above Ballaghbeama (Ir. Bealach Béime, 'way/pass of the notch'. Together with its neighbour Beann and their satellites, it forms a horseshoe ridge that confines a narrow glen known as the Pocket. 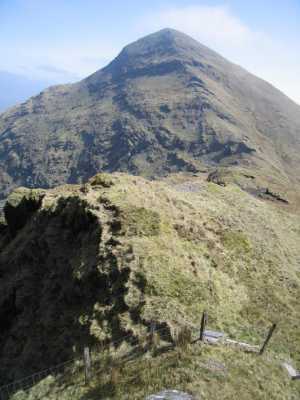 Mullaghanattin is the third highest mountain in the Dunkerron Mountains area and the 60th highest in Ireland. This high point of the Mullaghanattin Horseshoe. One approach is to park by the road at at Tooreennahone V747746 A, where the road forks. 100m before this point is a farm, where you should ask permission, but the farmer has previously been happy to grant this. Walk 100m along the track to the right before heading up the hillside to the east, which is steep in parts. 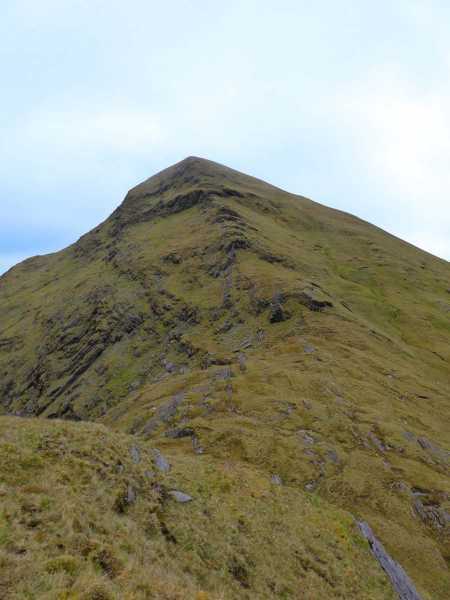 If you want to do the summit in isolation, veer to the NE as you ascend to emerge somewhere on the long ridge of ups and downs that lead from the north of An Cnoc Riabach, around point V755 767 B This grid reference in the text is shown as point B on the Detail Map above'>V755 767 B B. Turn NW for 1km. The terrain is grassy but firm, and a reasonably gentle slope until your turn west at V746 775 C, where it becomes very steep for most of the remaining 1km. The summit is on a small grassy area marked by a trig pillar. 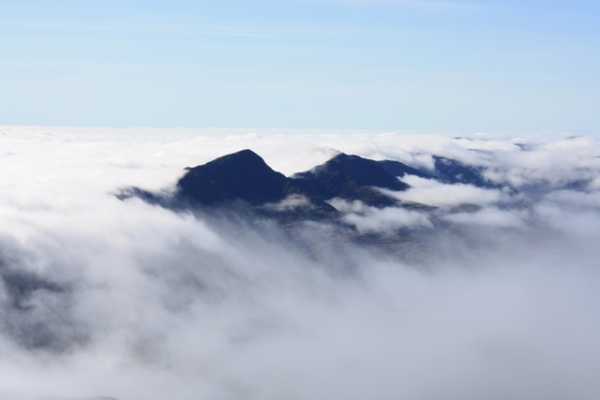 Time to do a complete circuit including Beann and An Cnoc Riabhach 6 to 7 hours for reasonably experienced walkers. Another, shorter route is from a point on the Ballaghbeama Gap road at point V757 780 D. Thge initial ascent is very steep. Ascend to the SW to point V755 767 B This grid reference in the text is shown as point B on the Detail Map above'>V755 767 B B and continue as above. Picture from ahendroff : Mullaghanattin "The Matterhorn of Ireland" ... do you agree? Picture: Mullaghanattin "The Matterhorn of Ireland" ... do you agree? Was Harold Segerson Mahony, whose family owned Dromore Castle in Templenoe, the area between here and Kenmare - the castle itself is in the woods by the sea, some miles south west of Mullaghanattin. He spent most of his youth in this area, and went on to win Wimbledon in 1896. He is widely accredited as being Ireland's last Wimbledon winner, though research has shown that he was actually born in Scotland and may be their only winner - at least until Mr Murray answers his fans prayers. He was romantically linked with the female tennis star of the time and 5 time Wimbledon winner Charlotte 'Lottie' Dodd. He won an Olympic silver medal for the same sport in 1900. So apart from growing up in the shadow of the Dunkerrons, what's his link to this mountain? Well in 1905 his body was found at the side of the road in Ballaghbeama, the mountain pass to the east of Mullaghanattin. He had been out cycling and struck by a horse and cart, and by local accounts the owner was unjustly tried for murder and hung.